FAYETTEVILLE, PA -- 'I want to go play it again,' answered Penn National Golf Club's General Manager, Bill Klimkiewicz, when asked what impression he'd like players to leave with upon finishing a round on his club's Founders Course. The return customer -- perhaps a business's most sought after commodity. Learned economic practice dictates that in order to succeed as a seller, you must first find a buyer, then entice him to return to purchase again in the future. The view from behind the first tee. Classic golf, straightforward design. Luckily for Klimkiewicz and the folks at Penn National, making people happy isn't a problem. 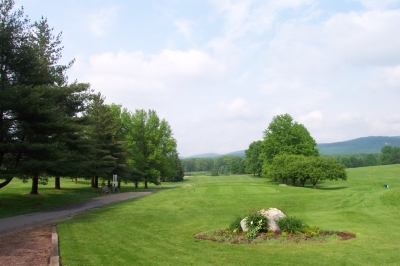 That's because the Penn National community offers two very fine, upscale golf courses, the Edmund Ault designed Founders Course, built in 1968, and the Bill Love designed Iron Forge Course, which opened in 1996. Penn National is a product of the fertile mind of local business legend T.K. 'Pete' Nitterhouse, and because its roots sprung from a solid business foundation, getting folks to come back hasn't been an issue. 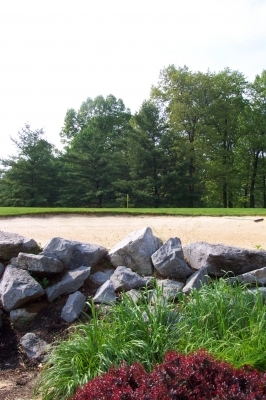 For this residential golf development a little over two hours from Washington, D.C, loyal and satisfied golfers have been returning for years. 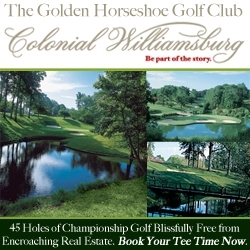 It's not really one of those 'best kept secrets' you're always hearing about, but also not a name rolling off the lips of many Capital area golf aficionados. That's a shame, since Golf Digest saw fit to award both of Penn National's courses 4 1/2 stars (out of five), which makes them two of the highest rated courses in the region. 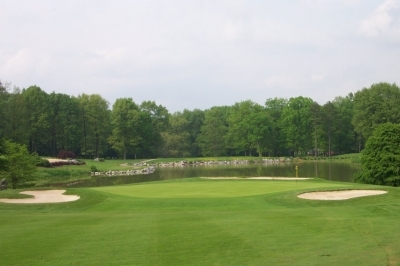 And while we're not going so far as to say these layouts trump the balance of the competition in the Mid-Atlantic region, they certainly deserve mention amongst the best upscale golf facilities in the DC/Baltimore metro area. The par five 14th hole requires accuracy tee to green. It all started with the Founders Course, which in Klimkiewicz's estimation, is a worthy place to establish a reputation: "The Founders Course is a big sixties design, with wide playing areas, big greens and mature trees. The land that it's built on was former farmland, and they created the layout using rye grass fairways and tees and Pencross bentgrass greens. They didn't move a lot of dirt -- it apparently was a pretty good piece of property that they developed, then planted several thousand trees." Klimkiewicz (hereafter known as 'Bill K') is right -- the Founders Course certainly is a classic in the design sense. While a good portion of the upscale public golf in these parts was built in the past decade (and hence, has a 'new' appearance), the Founders presents a very mature look and feel to it. And those thousands of trees -- they've had time to grow themselves, with nary a sapling to be found. The playing areas are definitely wide enough, but if you're in amongst the arboreal inhabitants, you'll grasp the aged quality of the surroundings. Tom Clark, of Ault, Clark & Associates (Ed Ault's firm), says the course was built before he joined the firm, but he certainly is proud to include it in his company's portfolio: "Though I wasn't involved in the original design, I've played it about a half dozen times. It's a very strong layout, kind of a classic style golf course. Penn National's a very nice facility, and we're happy to have our name associated with it." The uphill, par four 8th hole is the Founders Course's #1 handicap hole. It measures 436 yards, but plays much longer. Clark's impressions probably have something to do with the same types of pleasant recollections you'll leave with from Penn National: "I remember playing one of my last rounds with Mr. Ault on the Founders Course (Ed passed away in 1989). I remember him birdying the first four holes -- without hitting any greens in regulation. He chipped in on four straight holes, it was amazing." Such success might be an once-in-a-lifetime thing, but similar positive experiences are probably an everyday occurrence at Penn National. Part of the reason for those positive impressions is its playability. Bill K. expands on the notion: "The Founders Course is a fun track for high handicappers, because there are virtually no forced carries, except for the 17th hole (a 184 yard par three over water). 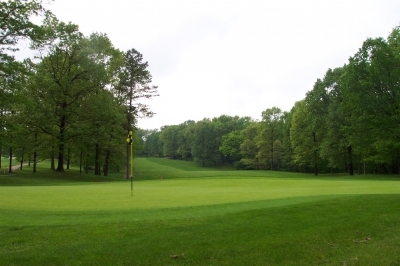 We also keep the trees limbed up pretty well, so if you hit it a bit off line into the woods, you can usually go in there, find your ball, and punch it back out into the fairway." He continues, "But if you play it from all the way back (6958 yards, par 72), it's a pretty tough course. The biggest resistance to scoring is keeping it in the fairway. If you're hitting it sideways out there, it can make for a long day, because although you can probably still find it in the trees, you most likely won't be able to advance it forward -- so it's like a penalty." Here, looking from the 18th tee, you'll see the beauty that is Penn National. That's an understatement. Though you probably won't accumulate an impressive number of 'traditional' penalty strokes on this course, you also might want to keep a tally of the strokes added by bouncing golf balls off trees like pinballs in an arcade. But as mentioned earlier, another way people enjoy the Founders Course is because of the putting surfaces -- not only the generous targets, but also their conditioning. "The large greens allow for many different pin positions, which together with the greenside bunkering, allows for setting up the course in a variety of different ways. For that reason, people see quite a lot of variation in this course," said Bill K.
"But we've also worked very hard on the greens in the last four years, to give players the types of surfaces they'd expect from a well conditioned, classic designed course. We've deep drilled them twice (the Floyd McKay process, where you drill each hole to 10 inches and fill with a mended top dressing to break up the profile), and along with regular aerification, we've found they've responded very well," Klimkiewicz added. Greenside on the par three 17th hole, there's color and substance of many varieties. 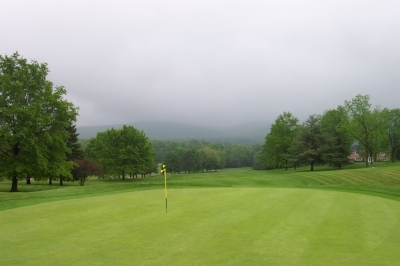 We played the course in late spring, and with the significant rainfall we've experienced this season (2003), everything at Penn National was lush green, as you'd probably guess. In addition to the mature trees, the heavy rough provided its own penalties. But Bill K says that it's usually cut down lower: "The course has been playing really tough this spring, with that 3 1/2 to 4 inch rough that's thick and a little wet. You really need to manage your game when you're off the fairway -- take your medicine and chip it back to the short grass. But under normal circumstances, we maintain the rough at 2 1/2 inches, so it's quite a bit easier." That didn't help our scores for this trip, but despite some healthy numbers, it was easy to appreciate the beauty of the surroundings. 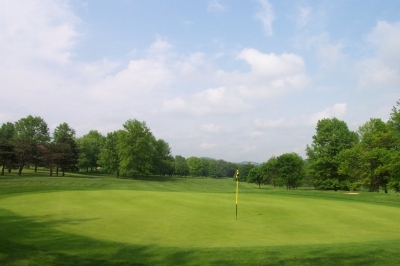 The Founders Course lies in the Cumberland Valley, surrounded by majestic mountains and the region's rich history -- Revolutionary and Civil War (Penn National is about a half hour west of Gettysburg National Military Park). 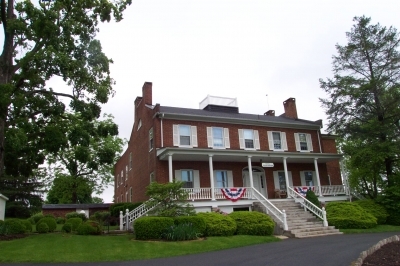 The property also boasts a 19th century Manor House, which serves as the figurehead for the Penn National Inn -- so you can even stay on property. A final note before describing a few highlight holes -- Bill K says they're always looking to improve the playability and course conditions on the Founders Course (even though they're already excellent). Here's how: "Over the years, normal wear and tear has taken its toll, so we're in the process of developing a master plan and review there, to rebuild some teeing areas -- bring them up to more modern specs. We're also going to rebuild all the greenside bunkers -- referring to some old aerial photos for the right shapes and sizes, as well as bringing in some larger granular sand that's a bit easier to hit out of." The round begins with one of the easiest holes on the course, a downhill, 356 yard par four. A lake serves as the backdrop to the green, so what the hole lacks in spectacular challenge, it makes up for in pleasing aesthetics. 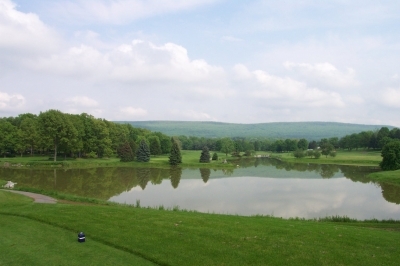 A sizeable lake serves as the backdrop for the par four 1st hole. The trees start coming into play on what Bill K calls the Founders' 'Amen Corner,' holes three, four and five. Five is a slight, sweeping dogleg right, with a large bunker protecting front-center pin positions. Beware of going right off the tee, as the forest awaits, with virtually no options but pitching out horizontally. Seven is a brand new hole (redone to accommodate some new residential development). It's horizon-to-horizon wide -- or at least it seems that way -- so let the Big Dog hunt off the tee on this 601 yard hole. It's a traditional three-shot par five, and despite the considerable girth of the hole, requires some careful placement to attack the pin on your third shot. The back side presents a dramatic and difficult closing sequence, starting with the fourteenth hole, a 551 yard par five requiring accuracy from tee to green, due to its somewhat narrow playing corridor. The 18th hole is a fair test to complete your round -- and you'll certainly want to see the Founders Course again. Sixteen is rated the number two handicap hole on the course, but probably takes the top prize in difficulty. 461 yards in length (and according to Bill K, often plays into the wind), the hole bends slightly to the right. Though you probably won't have much tree trouble on this hole, you'll need great distance on the tee and second shots to reach the green. Seventeen is the signature hole on the Founders Course. 184 yards over water to a nicely landscaped green. Grab your camera. Finish up with the 405 yard, par four 18th, which plays slightly uphill on both shots. The green is large and fairly undulating -- you'll certainly earn a final birdie should you make that score on this hole. It's a short ride back to the clubhouse, where you might want to take in a bite to eat at the Founders Grille, which overlooks the course down below. Or, don't be surprised if you're thinking 'I want to play it again.' You wouldn't be the first to want to challenge the Founders Course over again. Where To Stay: Accommodations available at nearby Chambersburg, though we recommend staying right on property at the Penn National Inn (there are also stay and play golf packages available). The Inn is located adjacent to the 8th fairway on the Founders Course, and offers 52 guest rooms with two full-size beds, cable TV, refrigerators and coffee makers in every room. The rooms are a good deal larger than a 'standard' motel room, providing more than enough space to do your morning stretches prior to hitting the links. You'll check in at the Pre-Civil War White Rock Manor House, which also has four guest rooms (and according to the clerk, some have suggested that 'spirits' reside there, too). In season (mid-April to mid-October), $55 for 18 holes with a cart, Mon-Thurs and $68, Fri-Sun. Senior discounts available Mon-Thurs, with twilight rates starting at 2:30 p.m., and super twilight at 3:45 p.m.